Good afternoon everyone. Due to moving and all the rigamarole that comes with the insanity of moving to another city, I haven't had a chance to film episode 3 of Transpicuous News.... and most of the material I have been enthusiastically screen shooting and noting and dissecting is now old news, lol. One of the news stories that I have been following closely was the patently ridiculous ECB Bank "stress test" that was rolled out. Seriously a facepalm moment of epic proportions. I haven't had a chance to write or record a video on this yet.... and then this article passed my desk (so to speak), and it clearly outlines a good portion of my thoughts on the whole circus. I will add to this one thing: If you were to look very carefully into this "stress test" you would see the amazing slight of hand tricks that they have played to shuffle the books as best they can to at least attempt to make this all look legit. Portugal and Spain have openly been selling off their "bad banks", Italy has been doing the banking shuffle in a desperate bid to appear to still be afloat, and Greece..... well Greece is a shining beacon of the reality of financial and economic cheep parlor tricks that very clearly shows that "bond" "redemptions" mean absolutely nothing in the world of finance that creates new rules and alters the play books minute to minute to enable them to sweep as much of their dirty laundry under the carpet as possible. France and Germany are not far behind..... and ones needs to ask themselves what happens when their dirty socks and skid marked tighty whities start to spill out on the floor for everyone to see? Bundesbank much? The reason we bring this up, is because just after the latest "most serious, most confidence inspiring" stress test was revealed, that perpetual troublemaker, the head of Germany's IFO Institute, Hans-Werner Sinn, who relentlessly refuses to drink the European Kool Aid, pointed out something rather stunning. According to Bloomberg, in an emailed statement, Sinn said that "ECB avoided modelling a deflation scenario for southern Europe which explains why the capital shortfall was so small for many banks." Additionally Sinn said that the change in relative prices that includes inflation in north and deflation in south is “unavoidable” if southern European countries are to regain competitiveness without euro-zone inflation. He added that regaining that competitiveness solely via inflation in north - something Germany clearly is not too crazy about - would violate ECB mandate. HIs conclusion: the AQR/stress test implied inflation for all of euro zone to prevent too many banks from failing test. We will leave what the ECB implied aside for the time being, and instead merely focus on his claim: if indeed the ECB completely ignored to model deflation as a possible outcome, then it makes an even greater mockery of the ECB's pet "confidence building exercise" within the financial community. In an effort to fool the public into believing the latest round of bank stress tests were actually designed to find stress, the ECB found 25 scapegoats, with the biggest losers in Italy and Greece. Interested parties may wish to slog through the full 178 page Stress Test Report. Here's a chart from PDF page 75 (report page 67) with thanks to ZeroHedge. There is €879 billion in nonperforming loans but the report concludes bank assets are only €48 billion overstated. Apparently we are to believe there are adequate loan loss provisions for rest. Reuters reports ECB Fails 25 Banks in Health Check but Problems Largely Solved. Roughly one in five of the euro zone's top lenders failed landmark health checks at the end of last year but most have since repaired their finances, the European Central Bank said on Sunday. Italy faces the biggest challenge with nine of its banks falling short and two still needing to raise funds. "This seems as if it has been pretty unstressful," said Karl Whelan, an economist with University College Dublin. "The real issue is the size of the capital shortfall and that is very, very small. I don't feel a whole lot more reassured about the health of the banking system today than last week." The Financial Times reports ECB Says Banks Overvalued Assets by €48bn. The European Central Bank’s dissection of the books of the eurozone’s biggest banks has found lenders overvalued their assets by €48bn. The results of the ECB’s examination of balance sheets worth €22tn, known as the Asset Quality Review, will require the 130 lenders who took part in the exercise to adjust the value of their assets in their accounts or prudential requirements. A quarter of the reduction, €12bn, will fall on Italian lenders, an amount just short of 1 per cent of their risk-weighted assets. 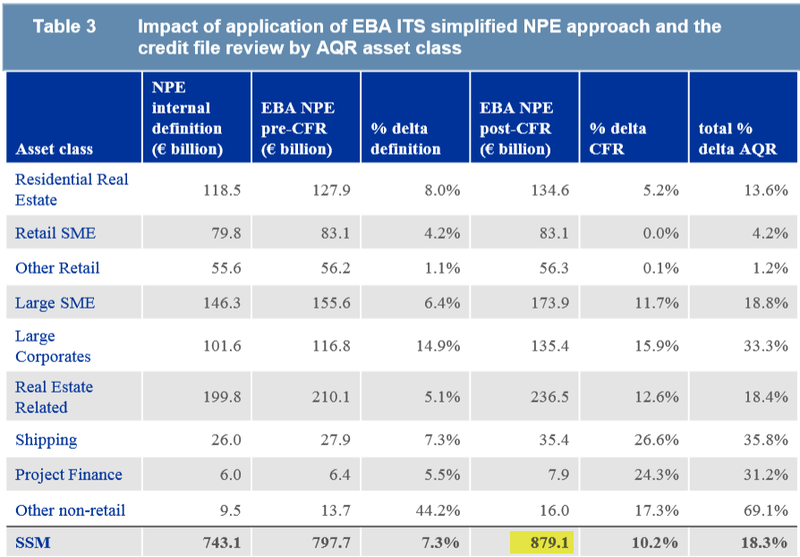 Greek banks will have to lower their asset values by €7.6bn, or almost 4 per cent of their risk-weighted assets. Philippe Legrain, an economist and former adviser to then European Commission president José Manuel Barroso, described the tests as a “whitewash”. “The ECB singles out less important banks in less important countries and gives the German banks a clear bill of health,” Mr Legrain said. German lenders will have to lower the value of their assets by €6.7bn and their French counterparts by €5.6bn. The AQR reviewed 800 portfolios, which together made up more than 57 per cent of banks’ risk-weighted assets. The ECB said they examined 119,000 borrowers and valued 170,000 items of collateral. Supervisors also built 765 models to challenge banks’ estimates of their provisions. The 130 banks account for 81.6 per cent of all eurozone assets. Non-performing loans total €879 billion out of a total balance sheet of about €22 trillion. That's approximately 4% of loans. Of the 130 banks, 25 failed. That seems like a lot. However, the total amount of under-capitalization is a mere €48 billion. That is an overall asset overvaluation of a mere 0.218%. Anyone seriously believe that €48 billion is credible with France, Italy, and Spain in or near recession (and Germany heading there)? I don't. It's not even a generous rounding error. Have Spanish banks written off 100% of their bad property loans? What about sovereign bonds assumed to be 100 percent risk-free? Didn't Greece prove bonds payments are not sacrosanct? What happens when the eurozone splinters? Here's the answer: German banks are going to take a massive hit. Huky Guru has some interesting figures about Spanish banks. About a year ago, Guru reported that a Reclassification of DTAs (Deferred Tax Assets) provided an extra €30 billion capital for Spanish banks. Guru brought up the subject again today in Putting the Stress Tests in Context. Paraphrasing Guru ... Accounting magic and government decree has allowed banks to compute an extra €30 billion in capital for Spanish banks via DTAs. 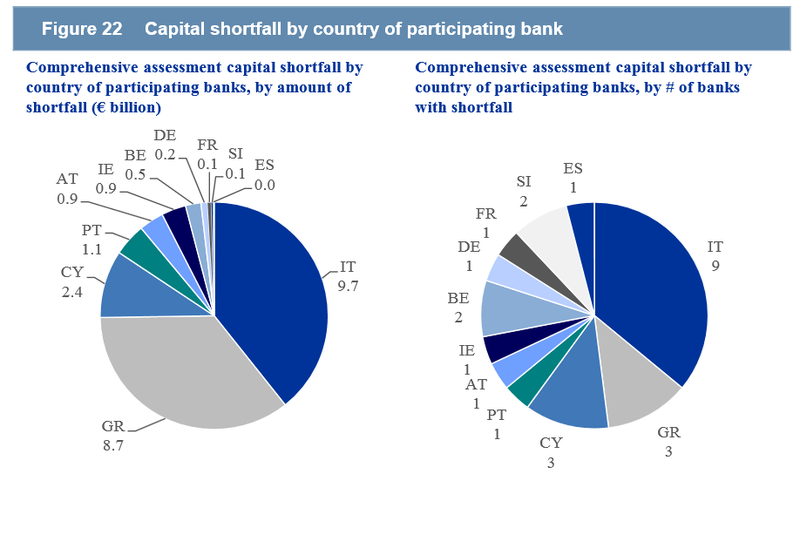 Without that €30 billion, the average Tier 1 capital for Spanish banks would have fallen from 9.1% to 7.1%. More than one bank would have failed the test. 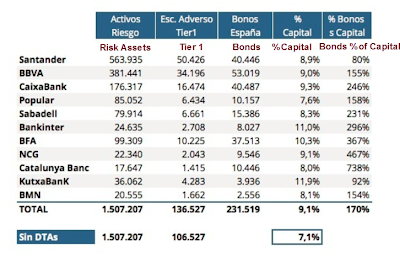 Guru notes "Spanish banks hold Close to €231.519 billion in Spanish bonds, almost twice around the capital of the Spanish banking system." 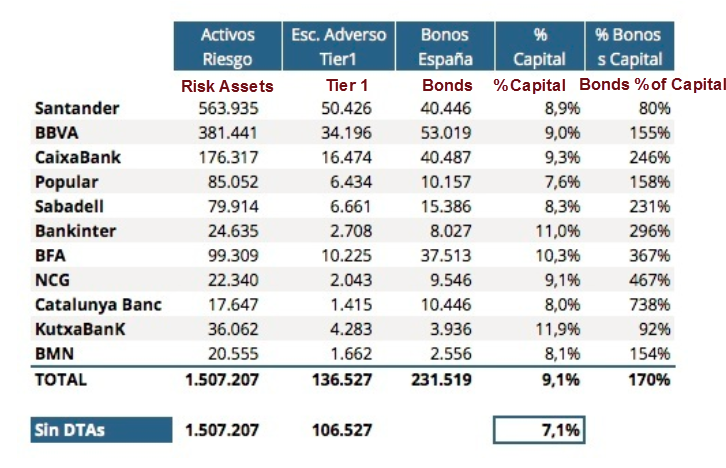 At least six Spanish banks have massive leverage in bonds. Catalunya Banc and NCG are particularly exposed. The entire exercise was another stress-free farce.